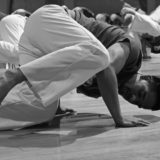 Home » NEW TO CAPOEIRA? Expect to train hard!!! Sinha Capoeira is more than just a workout. Come to class and enjoy the energy of the roda!! We can give an example of our typical capoeira class, however trainings vary all the time and are full of surprises!! Class usually begins with a warm up, all levels training together. After about a 30 minute warm up/workout, the class is divided according to levels. Repetition brings perfection, try as hard as you can each time you train. Your body will soon learn the unfamiliar and conquer the difficult movements with time, patience and attention to technique. Don’t be discouraged if you don’t catch on right away – feel free to ask questions, seek guidance from older students. We are here to help! A water bottle, because you will need to stay hydrated. Do I need to be fit to start Capoeira? No. Capoeira is for everyone no matter your fitness level or age. Any rules or etiquette I should know about?